Isnt very strange that they have not announced the next BB team in LVO? Not really - they showed a lot of other stuff off, they didn’t show a BB team there last year and they have quite a lot of reveal events through the year now to show them off at. I think most of us might have assumed they would continue releasing one team per quarter. So about now they should have announced the next team, hopefully they just do a surprise announcement on the community site instead of holding off until warhammerfest which is some months away. I could see a vampire team pop up with the fantasy box of skaven vs ghouls coming out. I played with a guy Friday who swore up and down the next team was halflings. Said he.knew a guy who knew a guy yadda yadda. If true it would be pretty cool though. I want the next team to be lizardmen so baaaaad. I second this, even though I don't play Lizardmen. They have a different enough playstyle and aesthetic that warrants an earlier release in my opinion though. I'm curious to see when the next team will get announced....is the next event Warhammer Fest? Because I don't think they would release the first BB team of the year May or June. I suppose they could always announce it on Warcom, but lately pretty much everything is getting an event reveal. In theory every 3 months a new team would come out. haflings would be very cool, but personally I would prefer chaos dwarves or norsca. And everyone is waiting for lizards. Oh, good call folks. I spaced Adepticon. If I remember right we didn't get the Chaos team until April last year. We also had Undead 2nd Week of December and I think Nurgle was early October, so they kind of crammed the last two teams in last year. Either way I'm interested to see what's up next. I don't think the Blood Bowl releases have had anything at all in common with the AoS releases so far, so there's absolutely no reason for this to be the case. Plus the last team was Undead anyway. There's a chance that they might take the opportunity to expand on the Shambling Undead box set by doing the Necro and/or Khemri teams as a follow-up, but there's no reason to actually expect that to be the case. Note that I'm not suggesting that it will definitely NOT be the Vampire team. I'm just saying that there's no evidence for that, regardless of the AoS releases. There are rumours that Halflings are coming. I don't know how legit these rumours are (could be 4chan nonsense that is being repeated because it's funny) but that's the only real rumblings I've picked up on, and even then, I'm only repeating it because its already been repeated by others so frequently. I kind of hope it's NOT Norse as I've got a plan to convert a team from Blood reaver bodies with Space Wolf heads, with unarmoured Wulfen for Ulfwereners. Will be a fair bit more expensive than the team release will be though! There’s a few of us in the FB Loot Group likely to attend Warhammerfest (including two of us admins). So if there’s anyone out there wanting one that doesn’t get regular, or indeed any, GW Events near them, follow the link in my signature. Same goes for other Event Exclusives, and pre-releases. Just be aware that postage to outside of Europe can be a bit much if you’re just wanting the one! As always, you are doing the God Emperor's work. I hope the other event exclusives are a bit more original than the Minotuar. It's the same model that was released months ago, just with claw hands and a new helmet. Everything else is the same. Is there any hope that the next team will be on pre-orders next week? 0.0000001% given all the other stuff being previewed at the moment. 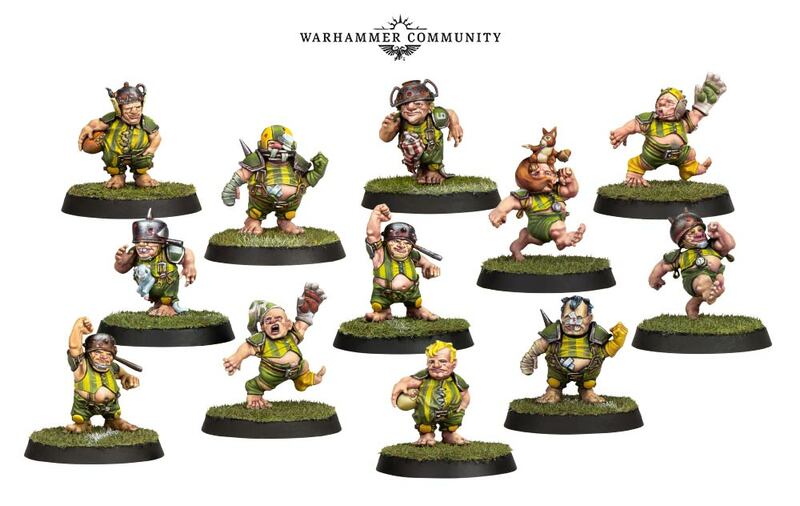 Well, can't say they were the team I was wanting to be added to the lineup, but man do those minis shout "halfling" to me. Nice sculpts GW. This halfling team <3 It's been a while since I though INSTABUY ! I'll convert them for AoS. I thought they’re really good. Quite characterful. Though perhaps less of a GW look than I would have expected if they’d said they were gonna do them before seeing them.. I managed to snag a couple of the old metal treemen when they popped up on made to order and I have been waiting to see these. They dont disappoint either I think they look really good.